I knew this could be a problem. Less than 12 hours after returning from my heart-thumping rendezvous with Santa Fe and Albuquerque, I departed for a first date with Austin, Texas. The pitfall of such brazen promiscuity? I’d gotten so besotted with New Mexico that I forgot to do any research or planning for Austin. I scooped up a few articles I’d printed out ages ago and scrambled to make my flight. Now, as many of you know, this is highly out of character for this congenital planner. (I didn’t earn the nickname “Planny McPlannerson” for nothing.) Arriving in a place I’ve never visited without a guidebook, map or at least a heavily-researched list of ideas is frankly unprecedented. I was winging it, and I felt out of sorts. I also felt somewhat unburdened. I couldn’t be responsible for the success or failure if I didn’t plan it, I rationalized. To be fair, I have gone on spontaneous adventures orchestrated by non-planner, Type B friends and significant others. And I enjoyed how they pulled me out of my comfort zone. But in those instances, I just followed their lead. This time I was meeting a college friend who rivaled me in the planning department. Shockingly, though, she confessed she hadn’t had time to look into Austin either. Gulp! So here we were – two Type A control freaks in a rental car without even a decent map to pee on. For a panicky moment, I didn’t even think we had the address and directions for our B&B, though it turned out we did. The sensible thing would have been to rent a GPS with our car, but we gamely headed out with our crappy Avis map. Not surprisingly, we were soon muttering “This can’t be it!” and calling the B&B to find out where we’d gone wrong. Fortunately, once we found the historic Woodburn House (built 1909), located in the venerable Hyde Park neighborhood, we realized we at least had a soothing resting place. 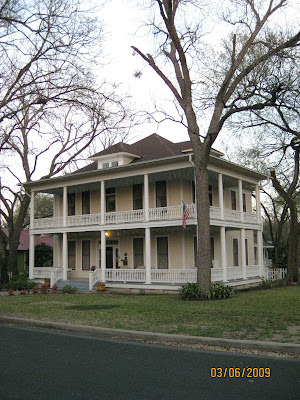 With its double porches and yard full of pecan trees, things were looking up. 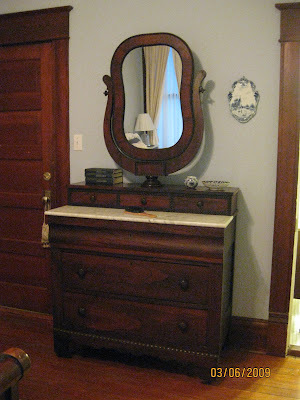 Plus, our lovely room (a steal at $125/night including breakfast) was remarkably plush and period-appropriate without any of the bright floral prints or doilies you might expect. Instead, we got soft robes and plenty of surface space, a real luxury when you have toiletries for two women. Yes, we were here, in a grand mansion surrounded by tiny Craftsman bungalows, but now what? Being in Texas, eating some BBQ seemed like a good first move. 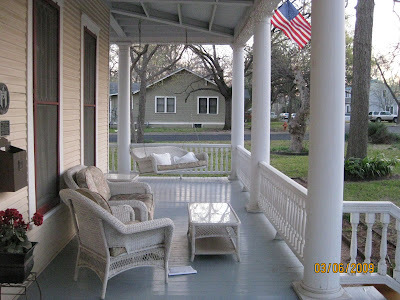 So we pulled out the laptop and headed to the upstairs porch to do some Googling. The air was warm and humid (an odd sensation having just come from arid New Mexico), and the reviews were equally confusing, pointing us to joints outside of town (e.g. The Salt Lick) for “the best BBQ in Austin.” With our paltry map, and the growing darkness, we balked at driving that far. Eventually we gave up and decided to drive towards downtown. We were winging it, after all. 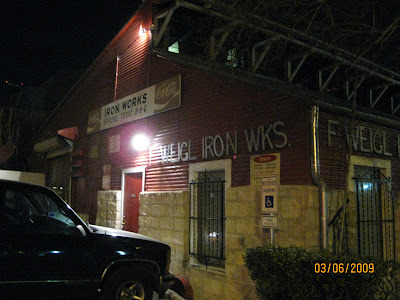 We were soon rewarded for our intrepidness with Ironworks Barbecue, located in a former ironsmith’s shop south of the rowdy Red River District. (According to their website, they’re ranked #1 in Texas, but isn’t it funny how every BBQ place is rated “top” by someone?) 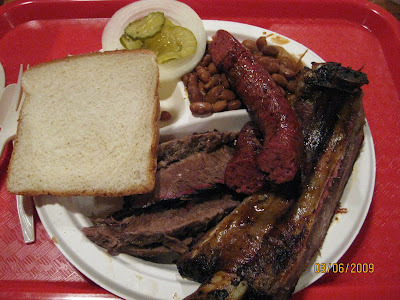 We ordered the $12.95 sampler platter, which came with sliced beef, one rib, sausage, beans, potato salad, pickles…and a slice of white bread. Yep, soft, enriched sandwich bread like you’d buy at the grocery. I was puzzled…and a little turned off. It wasn’t until I learned that the slice of bread was a deep South tradition – meant to sop up all the good stuff – that it made sense. But I still think it’s weird. Nonetheless, I managed to scarf up most of my ginormous platter (ignoring the bread) and still find room for the banana pudding. Sitting with our cafeteria plates on the screened porch, I was satiated - and staring to get a sense of Austin’s casual scruffiness. Later, we motored through the downtown club area, where pounding hip hop beats spilled out followed by packs of kids who seemed very young. This is a mild concern when I think of living in a big college town (Austin is home to the University of Texas, with 48,000+ students) – namely, feeling old and saying things like, “This place is way too loud.” So not surprisingly, we instead chose a tranquil gelato bar where we could hear each other and catch up. Normally, I wouldn’t question whether this was lame, but in a good-timer place like Austin, you feel a little ashamed. Tomorrow we’ll do better, we agreed. We just needed to find the part of town that was our speed. Have never been here but am intrigued - what is the water/heat situation like there? It was hot and humid (high of 85 degrees) in early March, so I'm going to hazard that summer is quite warm. Water, I'm not sure if you mean droughts or access, but there is a big lake (with the straightforward name of Town Lake) right in the middle of Austin. I'll be writing about biking around it soon!